Tulsi also called as ‘Holy Basil’, is an important symbol in Hindus Tradition, culture and they use to worship Tulsi plant every morning. The presence of Tulsi plant symbolizes religious bent in a Hindu family. Without having this plant, any Hindu family is considered to be incomplete. But, more than treating it as a holy or sacred thing, it has many medicinal uses that can be treated for many ailments. It is used as a primary herb in ayurvedic treatments. Tulsi has many herbal benefits and it serves as a nerve strengthening tonic and helps in improved memory. The leaves strengthen stomach and induce copious perspiration. It serves a major role in bringing down Fever and cold especially in Children. Serving hot Tulsi tea that is made with Tulsi leaves boiled in water or milk will let you bring down acute fevers. During rainy season, when malaria and dengue is more prevalent around the areas, tender leaves, boiled in water act as a best preventive measure against these diseases. Tulsi is the important ingredient for any cough syrups since it helps to mobilize mucus in bronchitis and asthma. Chewing Tulsi leaves will also bring good change in patients suffering from dry cough. Tulsi has strengthening effect on kidney. In case if the patient is suffering from kidney stone, allow him to take the juice of Tulsi leaves along with honey continuously for six months. This will expel the stone out through the urinary tract. The leaves are quite effective to cure mouth infections or mouth ulcers. Chewing Tulsi leaves will bring great relief to such kinds of problems. This herb will act effectively to treat any insect bites or stings. Applying the Tulsi paste on the infected area will relieve you from insect bites or stings. Also try to take Tulsi juice along with this to notice fast recovery. As shown in most of the advertisements in India, Tulsi is the main herbal ingredient for making any herbal soap since it has been found that this leaf has the capacity to treat on the skin disorders such as ringworm and leucoderma. The leaves of holy basils are packed with anti-oxidants and essential oils that help to treat diabetes. These substances help the pancreatic beta cells (cell that store and release insulin) function properly. With the strong anti-oxidant and anti-carcinogenic properties Tulsi has been found to stop the progression of breast cancer and oral cancer. Have the extract of Tulsi every day to avoid these conditions. Tulsi has excellent purifying properties that helps to pure the blood vessels and in turn make your skin to glow. Apart from this, it also helps to reduce the itchiness of the scalp and reduce hair fall. Eating Tulsi leaves, applying it on face, or having it as juice can make your skin glow healthy and shiny. 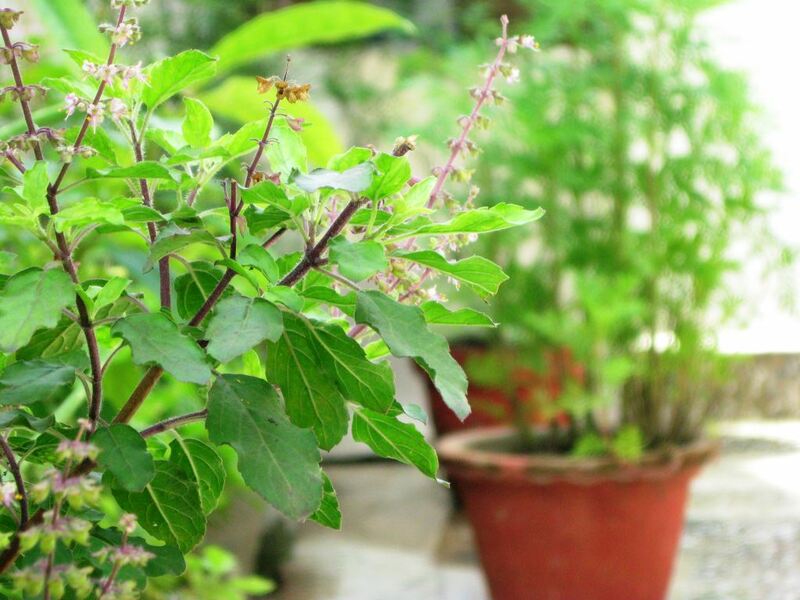 Tulsi is considered to be the sacred plant dearer to Lord Vishnu. It symbolizes purity. It is considered as the holy plant in most of the southern parts of India and worshiped every morning or evening in Indian Hindu families. It is mainly used in temples for worship purposes and also in other religious functions. Indian Women water the plants, light up the diya, and worship the Tulsi plant every day. It is said to be a very effective insect repellent. A good home remedy to treat heart and lung problems. Regular massage of Tulsi oil in your scalp regularizes your hair. Tulsi can also help to quit smoking. Tulsi juice acts as an excellent stress reliever. Eye disorders such as night blindness or sore eyes can also be cured using this herb. Thus Ayurveda holds lot of significance for Tulsi plant. The natural composition of Tulsi not only helps getting rid of disorders, but also tones up your body in various ways. That is why more and more people have started to take Tulsi as a part of their daily diet. Nice information. Thank you for writing this post.